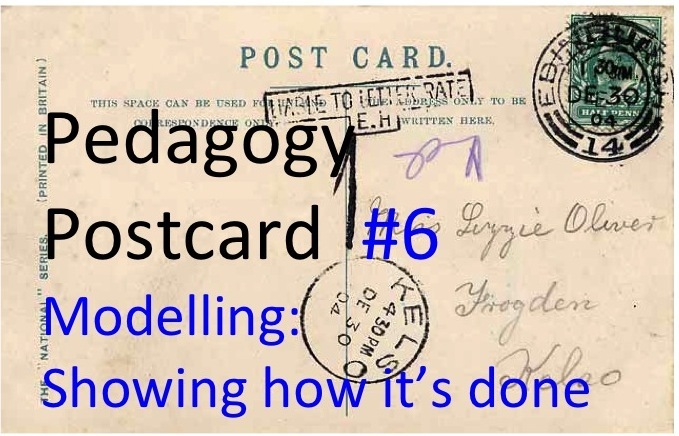 Pedagogy Postcard #6: Modelling: Showing how it’s done. 1. Modelling the learning outcomes that are expected – showing what the end point might look like. This is the subject of an earlier post Great Lessons 9: Possibilities. If students know what they are aiming for, it gives them a clear sense of the expected standards. They’re not left guessing or pitching too low – they are presented with exemplars to emulate. The standards are modelled. 2. Modelling the process of reaching those outcomes; of solving problems and producing ever better work. That’s the main focus of this post. Seeing what is required is one thing – but how do we get there? You don’t learn to play piano by watching a virtuoso performance or learn to write by reading a great book. You need to know where to begin and what to do next. In a repeatable skill-based task, this process is very obvious. 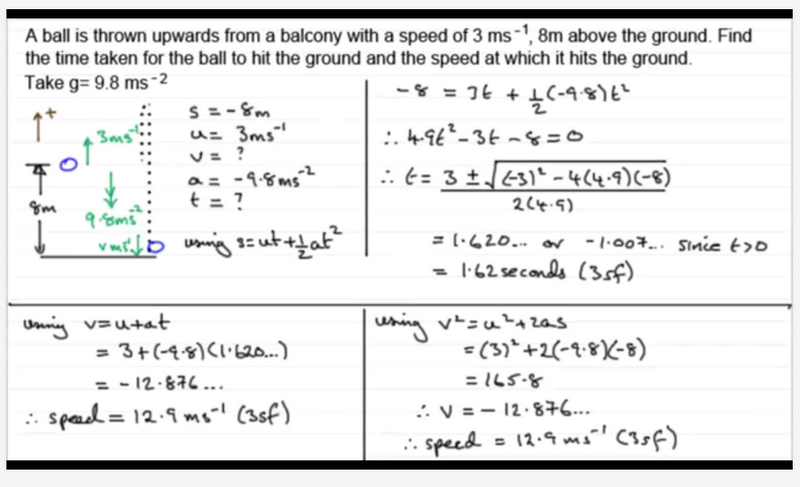 One of the examples John Hattie uses in his Visible Learning videos is instructing a group of people to abseil (Watch from 11 mins 30 secs). Here it’s clear that the most effective strategy is to show the group how to tie the harness, slowly and clearly, and then get them to practice with a bit of peer discussion thrown in. Hattie suggests that, too often, this elementary step of showing them how, is missed out and students are left to guess and flounder. This approach is at the core of army instruction as used by cadets in our CCF: Demonstrate the technique, then get them to practice. It applies to setting up a bivouac shelter, loading a rifle, plotting a course on a map and setting up a field radio: Explain it; demonstrate it; then get them to practise and repeat it. This works because the outcome is clearly definable and is expected from all participants; also the assumption of limited prior knowledge is also a fair one. But although the conditions are quite specific, the method works well. In lots of lessons, modelling the full process that students are to undertake is very powerful. In maths or science, this is the territory of the classic ‘worked example’. Once you’ve solved a few quadratic equations covering a few crucial variants, then all subsequent examples are just a repeat of the process. It makes sense to go through a set of examples in detail to show how they are done. Repeated practice of set-piece problems like this is highly effective and it is worth investing time in developing good clear step by step worked examples. This links to the previous post about expert knowledge: you need to be sure you can produce model answers to the questions you are setting – without relying too heavily on pre-prepared notes and that might be the best use of your CPD time. Establish what is known and what is not known; select the most useful equation; substitute the values and simply to find the answer. Remember to use correct significant figures and units. It’s just a case of taking stock and then sticking to the method. A typical model of problem solving. Note in this example, there are alternative solutions. That’s important to include in the modelling process so students don’t get bogged down in worrying which method is best. Sometimes, the modelling needs to stress the need for confidence and for making a few bold steps. 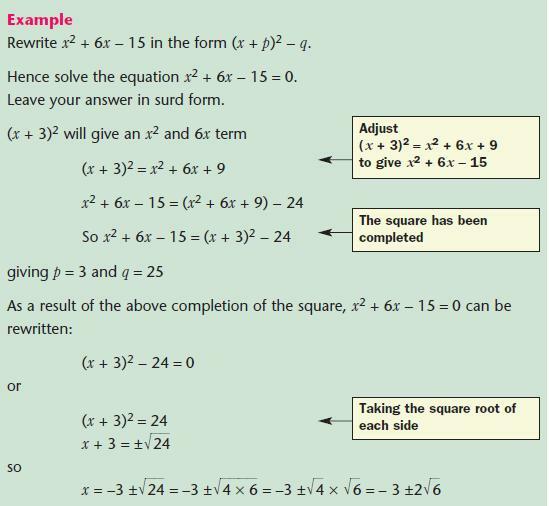 That is true of the examples in this post about maths problems – where students struggle simply because they don’t have the confidence to label the diagram. Find the fraction that is shaded. With labels, and without. The power of teacher modelling lies in finding a good balance with student practice. Model, practice review; model, practice, review…that’s the cycle that’s needed. My feeling is that we miss opportunities to model and there are still lots of occasions when students go from being told things in abstract to being asked to do things without anyone modelling the process explicitly. Did I show them how to plot a graph how I’d like? Did I show them how to set up an electric circuit to take lots of readings quickly? Did I show them how to do the calculation I’ve just asked them to perform? Too often, I think I’ve told them what to do, without showing them – and the difference is quite significant. This is especially true of written tasks, partly because teachers worry about the time it might take. It’s relatively rare to see a teacher show students how they would tackle a written task in full. However, modelling the writing process can be very effective. An important factor is pitching the modelling at the point that will take students forward; not pushing them off into the deep-end to flounder or showing them something they can already do. This video by Pie Corbett is a great example of a modelling episode. He’s taking Y1 students through the writing process.. ‘The Sea Dragon is a variety of dragon which you find sleeping or swimming in the sea’… (from 10 mins in…) It’s quite inspiring; packed with modelling of the features of creative writing. He’s doing it with them, leading them gently along and using their ideas but, all the while, steering the process to a great outcome. At GCSE and A Level in several subjects, I’d suggest that teachers don’t go through the same process often enough. There is a lot of reference to student exemplars that are already finished; there might be writing frames with sentence starters -that’s very common; and teachers often use mark schemes – which give bullet points about what might be included. However, it can pay off, every so often, to model the whole process of answering a question in full, providing a complete answer exactly like those students are asked for. Sometimes teachers worry that this can confine students; it can give the impression that there is a definitive response eg. with a history or RE essay. Certainly in Art, the modelling needs to be about the process of exploring new ideas and techniques rather than creating a model that then leads to convergence and conformity. But…with that risk in mind.. showing students how to go all the way from A to B in the learning process is worth doing from time to time. Really enjoying this series Tom. In our school we have recently identified 10 features of effective lessons. Each feature has an A4 side of further guidance written for staff (not prescriptive though- very “rainforesty”). This series (and your great lessons series) thankfully has many common elements with our 10. We cover modelling (not in this much top detail though) in our section on teacher clarity. Bring on the next 14. Thanks a lot Damian. It would be good to see your 10 features in a blog somewhere.. have you done that already? Not yet by now that I’ve started blogging it is getting pretty addictive. I may well do it over Easter. It could be an interesting or even contentious blog because we are basing our internal lesson observation discussions on (the spirit) of some of the features. Interestingly, my favourite of the 10 is clear learning goals- starting with an end point and working back to design tasks. Very similar to your postcard number 3. I have (finally) blogged about the identification and sharing of 10 features of effective lessons in my school (and linked it your rainforest v plantation blog). It’s at http://mrbenney.wordpress.com/2014/04/23/what-is-good-teaching-sharing-best-practice-across-the-school/ if you’re interested. Hopefully, they are very aware and well used to this cycle and indeed the gist of the article. Effective coaching in sport invariably has this at its core (see John Whitmore, ‘Coaching for Performance’). With the invention and availability of video in the eighties, the opportunity to use excellent modelling from videos (I called it videostudy)became possible but still too rarely used (in my opinion). Keep up the good blogging, Tom.